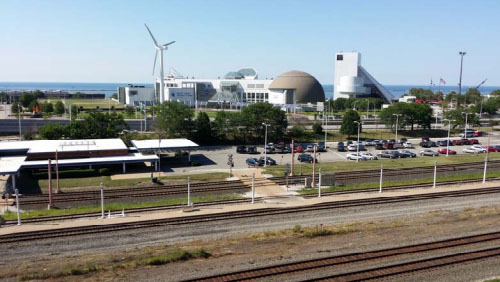 The Green Ribbon Coalition is proposing that the City of Cleveland, Cuyahoga County and other stakeholders consider the building of a land bridge from the Mall to the North Coast Harbor –instead of other types of structures that have been put forth. This document presents design guidelines and a concept plan for a land bridge that the GRC is recommending for further study. Extending the Cleveland Mall northward from the 1903 Group Plan has been discussed for decades. However, the infrastructure separating the city’s civic center from its lakefront has been one of the city’s greatest land use challenges (Figure 1). Over the years, a range of designs has been proposed combining different bridge and building structures to close this gap. Among these is the currently proposed cable-stayed bridge. Other cities are burying unsightly infrastructure while working to connect their city centers with their waterfronts. Structures such as the proposed cable-stayed bridge are better located traversing points of interest such as a river or sea channel. Cities like Chicago, Dallas and Philadelphia are capping their railways and freeways while reconnecting their downtowns with their waterfronts. Cleveland should to do the same. The City of Philadelphia has similar challenges as Cleveland with a freeway obstructing access to its historic waterfront along the Delaware River. 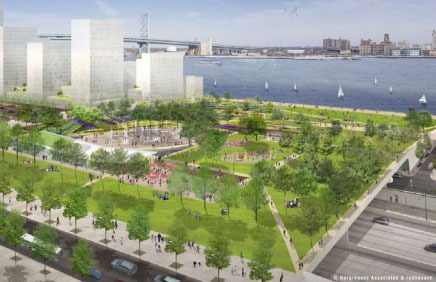 Conceptual designs released in 2014 show where a proposed waterfront park will cap Interstate 95, reconnecting Philadelphia’s City Center with its riverfront (Figure 2). The 11-acre park is part of a fully funded $225 million development initiative that includes recreational trails along the river. Be a part of the future. Invest a little green and a little time to help re-imagine and implement a bold vision for Cleveland’s lakefront and beyond. Click here to become a member today! Be a part of the future. Invest a little green and a little time to help re-imagine and implement a bold vision for Cleveland’s lakefront and beyond.